While Fantasy Flight Games’ Genesys system is an excellent ruleset with which to build your own homebrewed, narrative-driven RPG, so far it has largely required savvy game masters to put in extra hours to develop a setting, and create items, adversaries, and adventures. Luckily, for those who might be light on time or creative energy, Fantasy Flight Games has begun putting out in-depth campaign setting sourcebooks to serve as supplements to the Genesys Core Rulebook. 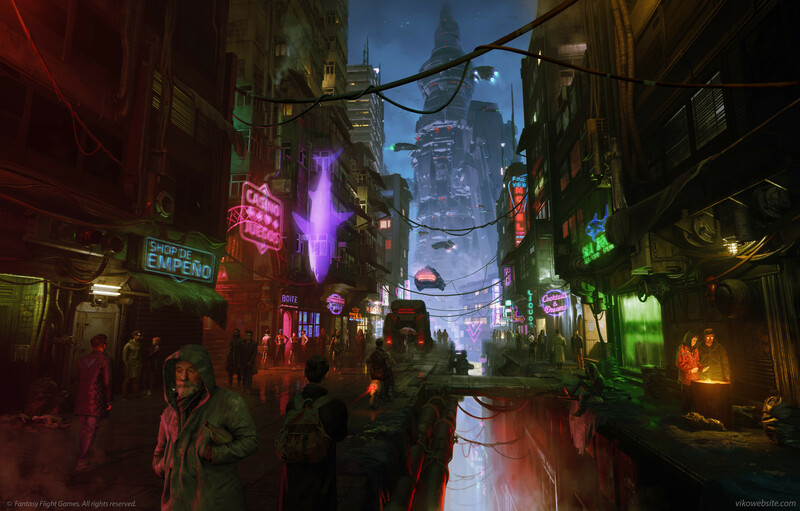 Their most recent creation in this regard is a cyberpunk sourcebook called Android: Shadow of the Beanstalk, which offers a gritty, neon-drenched world under the control of greedy megacorporations. The sourcebook contains 256 pages of rules, guides, sample characters, and beautiful art, which I’ll break down by chapter. After a brief setting intro, you’ll dive into character creation, which follows the Genesys formula fans will have gotten used to by this point. Instead of choosing a background or motivation as with other Genesys settings, you’ll start by deciding how connected your character is to technology and the digital world. While this won’t change much on your character sheet, the decision will have massive consequences for the experience your character has in the world. For example, as a “Modern New Angelino,” you’ll be fully seduced by the ease and advantage of technology, which comes with the downside of having your entire life available to whichever shady hacker or mega corporation wants to take a look. On the other hand, if you choose to play as a “Disenfrancisto,” you’ll play a character who has rejected technology and gained anonymity and a higher degree of freedom in doing so…however, not indulging in the technology available to the rest of the world puts your character at a great technological disadvantage. Now you’ll get to the meat of character creation by selecting an “archetype,” which is the equivalent of your character’s “species” in other Genesys games. Your choices are all human or near-human options, but you’ll be able to decide if you want to play as an artificial lifeform called a “bioroid,” or a citizen of the moon, called a “loonie.” After that you’ll select your “career,” which determines some of your starting skills, gear, and money, as well as deciding which skills will be cheaper for your character to buy into. You could be a fearsome bounty hunter, a shady con artist, or the powerful offspring of a corporation CEO. There are plenty of options available, and a lot to love about the diverse roles in a world where technology has gone mad. The next section of character creation contains new skills and talents that are specific to the world of Android, including talents that allow you to use drugs to regain strain at the cost of being disoriented, and skills that can turn your character into the ultimate hacker. As you might imagine, a lot of the skills here have to do with technology, hacking, and the need to thrive in a world where the Internet is omnipresent. But there are more unique abilities here as well, including talents dedicated to parkour and another where one’s knowledge of seedy cities becomes an effective combat asset. 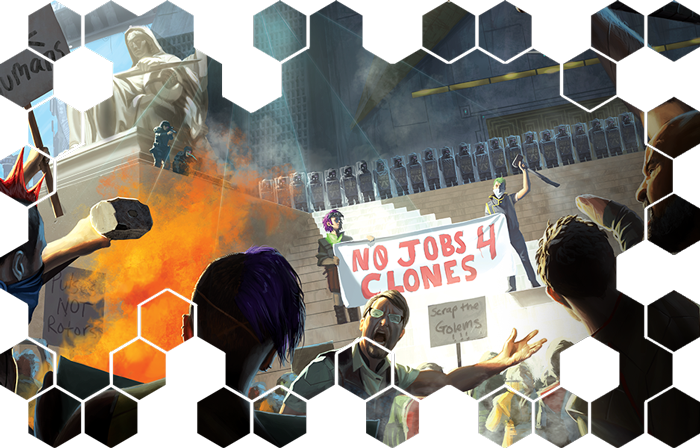 The final and longest step of character creation is determining favors one owes in Android’s “favor economy.” Here, you’ll need to become familiar with the setting’s various factions and decide which ones your character might owe her allegiance to or has become indebted to in some way. Taking on additional favors owed benefits your character by giving you a healthy chunk of credits (Android’s currency) or XP to spend during character creation. The bigger the credit, the bigger the payoff. By far my favorite part of character creation is this final stage, which encourages players to become immersed in the complex world that Android offers, while also giving your character baggage that becomes invaluable fodder for any GM worth her salt. It also happens to be the most unique part of character creation to appear in the sourcebook. 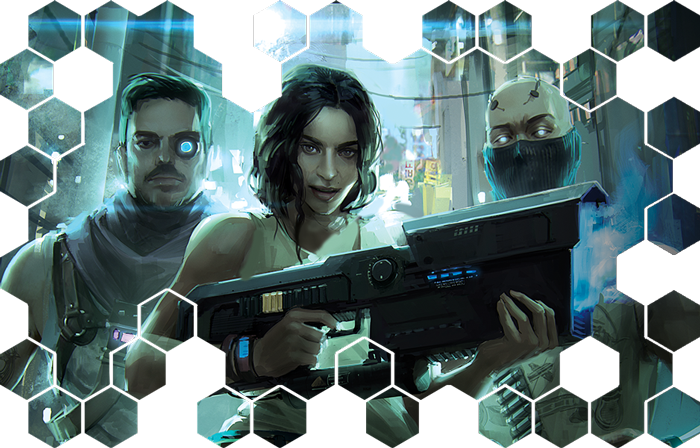 While all the other sections feel very familiar to a veteran Genesys user and none of the new talents, skills, or careers particularly stand out as particularly unique compared to other cyberpunk setting, the favors section does a great job at showing you exactly how unique the setting is, and forces you to become entangled in its web to boot. While the equipment and vehicles section that’s often present in science fiction RPGs is rarely the most interesting section, at its best it can generate interest by being filled with distinctive items and equipment that show off the setting in a way that gets players excited to dive in. Sadly, Android: Shadow of the Beanstalk falls far short of hitting this bar. Instead, it’s packed with the usual guns, armor, mods, attachments, and gadgets that you’d expect from a generic science fiction setting. While the body modifications are certainly more interesting than the rest of this section, sporting options that can enhance one’s hearing or give your character armor beneath her skin, it’s simply not enough to make up for page after page of generic equipment like flashlights, medkits, and rope that makes up the majority of this section. In a science fiction setting where one’s imagination is the limit, it’s disappointing to see such an uninspired array of consumables and equipment. While the vehicles offered are far more interesting and unique, there simply aren’t enough to get me excited, numbering at only 12 options across starships, ground vehicles, and flying cars. That’s right — twelve in total. Vehicles are one of those things that can make your setting iconic (look no further than Star Wars), so it’s a shame to see so little effort put into something that’s so important to a science fiction setting. 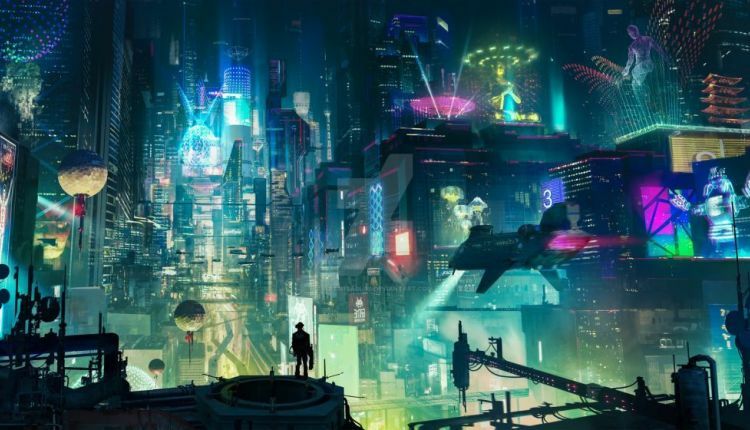 The ultra-connected nature of the world of Android is something very unique to cyberpunks, and the attention given to this section can mean the difference between success and failure as a system. Thankfully, Android: Shadow of the Beanstalk has spared no effort in creating a complex, entertaining, and unique set of rules that govern the setting’s digital world. From explanations of the Net’s inner workings and explanations of criminal activity, law enforcement, and religion in the web, to excellent mechanics for hacking and network encounters, Fantasy Flight Games has created one of the best structures for hacking and hacking prevention that I’ve seen in a game. At high levels, hacking a server properly requires multiple rolls and must overcome security protocols by pulling off a variety of Network Actions to outsmart and outplay their opponent. You might spend some advantage in a dice pool to troll your opponent, making them take strain damage, or roll poorly and get their identity discovered by the person they’re attacking. The rules are so nuanced that Network Encounters feel like all-out warfare that rivals even the most thrilling combat encounter. This is an area in which Android is truly at its best, and lives up to the promise of delivering the ultimate technologically-connected setting. As you might expect from a setting sourcebook, the section dedicated to the setting information is by far the largest section of the book, weighing in at a massive 77 pages and filled with art, maps, and descriptions of New Angeles’ seediest bars and most influential places. The information that lies within is dense and in-depth, offering everything from economic and cultural realities, to a complete history of all of the setting’s biggest historical events. For players, this is a chance to become immersed in a lovingly crafted science fiction world, and for GMs, it’s a treasure trove of ideas and places to use as inspiration for your campaigns. Earth isn’t the only place to learn about either, as you’ll also read about the lunar and martian colonies and the history of conflict and war that’s taken place between the kingdoms of the human race. As you might expect, far more time is dedicated to Earth, which serves as the primary setting of Android, but there’s easily enough information to go off the grid and host campaigns on the other planets as well. A favorite section for lazy GMs, the adversaries section serves as a veritable oasis for all manner of enemies, from minions to nemeses, to use or draw inspiration from for use in a campaign. You’ll find shady club owners, corporate hatchetmen, fearsome creatures, and brutally efficient robots, each complete with their own stats, skills, equipment, and more. My favorite part, though, is the section dedicated to bizarre and borderline mythical adversaries, entitled “True Oddities.” Here you’ll find peculiar enemies such as indestructible Terminator-like bioroids, to fearsome and mysterious mechanical kittens. While I love that they included this part at all, I wish they’d have expanded on it a little more, as it breathes some fresh life into the world and gets the creative juices flowing for GMs who prefer to stray from the beaten path. Finally, no setting sourcebook is complete without a section dedicated to helping the GM navigate the brutal, demanding, and thankless job of guiding the players through stories using the setting. While this section is quite slim compared to most other sourcebooks, it offers some invaluable tips for roleplaying the wide variety of people and classes that exist in Android, and guides for presenting your players this complex, fast-paced world filled with danger and espionage. Lastly, this section includes a guide for building adventures in Android, from hooks and adventure ideas, to escalations and climaxes that will leave your players feeling accomplished and satisfied. 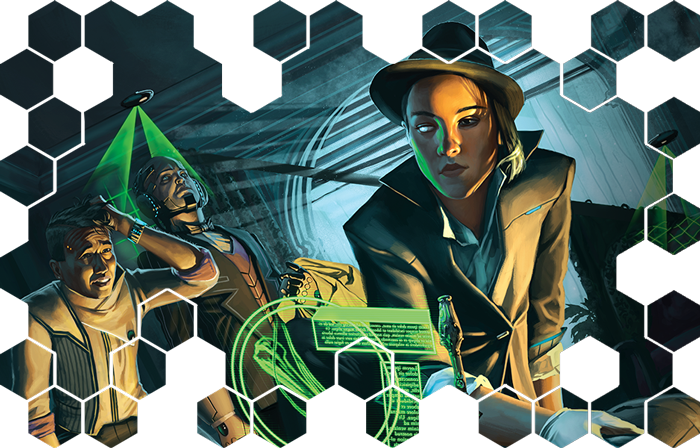 Android: Shadow of the Beanstalk is an excellent sourcebook, filled with indispensable setting information, useful new rules and features, and incredible art. 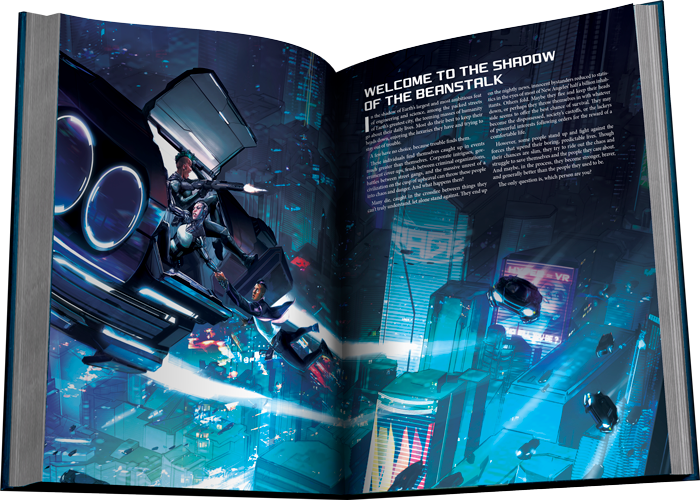 While the character creation and equipment sections are nothing we haven’t seen a dozen times before elsewhere, the rock-solid hacking rules and impressive “favor economy” system make this sourcebook a must-have for those looking to run a cyberpunk campaign using the Genesys system.